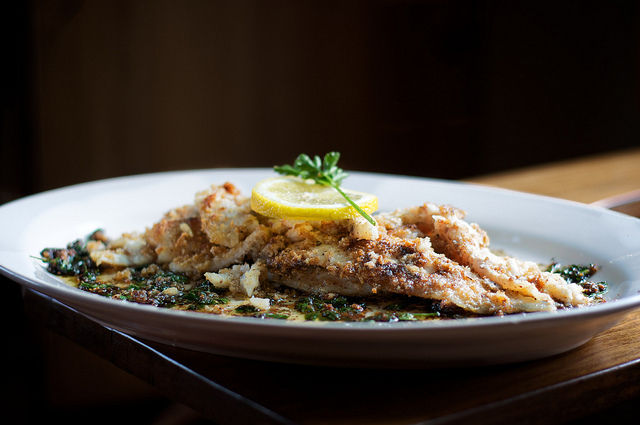 Sole meunière is heavenly – slightly crispy, dripping with brown butter and infused with lemon and parsley. For all its flavor of citrus, butter and fresh parsley, sole meunière is so simple to prepare at home, and like all of the most nourishing dishes, it s its very simplicity that is so appealing. And everything, everything, is better dripping with butter. Sole meunière is a simple dish. Indeed, it simply means fish prepared in the style of the miller’s wife – that is, dredged in flour. While all-purpose flour is typically used to prepare sole meunière, I prefer mine dredged in nut flour – hazelnut flour or even a combination of almond and hazelnut flour produces remarkable results and the combination of nut flour with browned butter is lovely. This dish nourishes the body just as it provides satisfaction to the palate. Sole is rich in b vitamins – particularly, niacin and the vitamins B6 and B12. It is also a good source of phosphorus and, like most seafoods, selenium. The addition of grass-fed butter provides even more nourishment including conjugated linoleic acid – a fatty acid found in the meat and butterfat of ruminant animals. Recent research has found that this wholesome fat holds strong anti-oxidant activity and may offer anti-carcinogenic properties; moreover, it may be linked to a reduction in adipose tissue – that is, belly fat. While all milk and beef offer CLA in their fat, it is only present in abundance in the meat and milk of grass-fed ruminants like cows, goats and sheep. Lastly this dish is seasoned with fresh lemon and parsley which offer a wonderful brightness and punch of vibrant, clean flavor to the rich, nut-like flavor of browned butter. 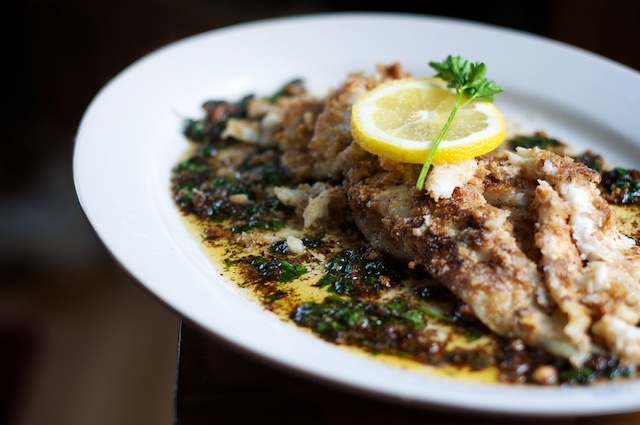 Sole meunière is a lovely simple dish, rich with the flavor of browned butter, fresh parsley and lemon. It’s easily prepared in under fifteen minutes, and excellent served with a salad of frisée on the side. Dredge the filets in flour until well-coated. Heat 4 tablespoons butter or ghee in a cast iron skillet over a medium flame until the butter begins to foam and brown (this foaming process will not occur if you’re using ghee or clarified butter). Reduce heat to medium-low, then place the floured filets of sole into the hot butter and fry on each side about two minutes. Remove the fish from the skillet and plate them. Heat additional two tablespoons butter in the skillet until melted, then add lemon zest, lemon juice and minced parsley to the skillet whisking together to combine for about one minute. Pour sauce over the fish, season with salt and pepper and garnish with lemon wedges. I got some sole at the store yesterday after seeing this and will be cooking it tomorrow. The photo is making me crave it badly. I wouldn’t recommend it – I don’t think the flavor of coconut would flatter sole or go well with butter, lemon and parsley. You can try it and let us know, though. Coconut flour would definitely not go. If you avoid grains, just omit the flour. Brush the fish with egg yolk and fry in butter as normal. I ordered Sole Meuniere in Paris once, and asked them to omit the flour; it was just as delicious. I’ve tried coconut flour for dredging my fish, mostly salmon & barramundi- no bother! Quinoa flour, chick pea flour- and by mistake, psyllium husks (someone tidying my pantry mixed things!) … all have worked as have all the nut flours. I myself have no sense of smell, but my picky adult son has not screwed up his nose at the various flours used ! Love the idea of blitzed parsley with all that lemony lemon! What fish would be a good substitute for sole? Would snapper or cod work? I’ve never had sole, so I have no idea what its flavor is like. Stacey. It has a flaky more delicate flavour than either the snapper or especially, cod. You’ ll love it. Jen, thank you for the recipe and reminder of what a lovely dish this is. I do, however, have one question as to your choice of curly leaf parsley. I worked for years in restaurants and it was always relegated to the use of garnish. It was Italian flat-leaf parsley that was used for cooking. Personally, I prefer the more highly defined flavour of the flat-leaf and its softer texture. Would love your thoughts. This is how I have always done it and it is a winner. Even picky non fish eating children like this one. Excellent. Thank you for your work.